Transform metadata transforms the result in some way, without creating new media or rendering. It Transforms the source without changing it. A simple example would be time and time zones. There is, of course, only one absolute time that’s experienced simultaneously around the world. However, we don’t work in that absolute time, but rather in local time. Local time is the absolute time transformed into local time using the time zone offset. All timecode starts as a frame count that is transformed into the appropriate timecode display. That way the same frame count can be transformed to display as drop frame or non-drop frame by changing the way the frame count transforms the raw frame count. A common production example is a Color Lookup Table or CLUT. Any RAW image — be it from a still camera or digital cinema camera, needs a CLUT to even look like a decent image. The image generated by a RED One digital cinema camera without processing. It’s only when a CLUT is applied — in real time — that the useful image is revealed. The source image is Transformed into a usable image. 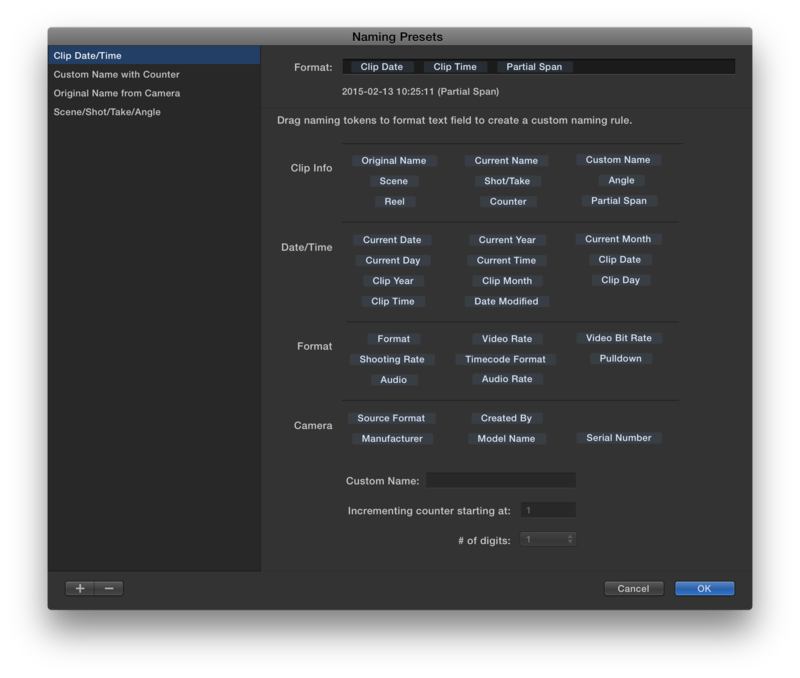 Another example of Transform Metadata is Final Cut Pro X’s Apply Custom Name function. The clip name is dynamically transformed to comply with the schema set for the custom name, without changing the original data or file name. 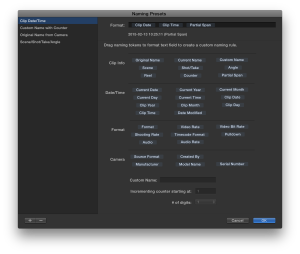 Create a dynamic, custom naming scheme to transform the Clip name. There is also a very real sense that an edited timeline is Transform Metadata: it transforms the source media ranges into something else, usually without changing the source media at all. As more and more of our filters, transitions and compositing becomes real time, it’s entirely reasonable to think that, in the future, we won’t need to render finished video because all edits will be source media plus Transform metadata. Of course, there will still be situations when it’s easier to flatten the structure into a single file to simplify for distribution, but keeping the source live is the likely future.